FUEL OUTAGE CONDITIONS THAT MIGHT OTHERWISE BE UNDETECTED. ISE's patented Fuel Usage Analysis technique is used to provide a highly reliable insight into the heating practices of a home, whether or not it's occupied. 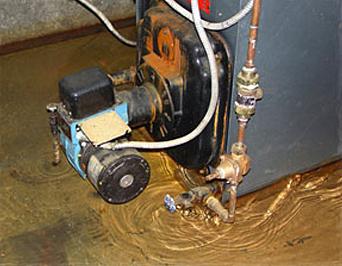 This patented system is able to confirm or dispute reported statements concerning occupancy based on existing fuel and weather data. 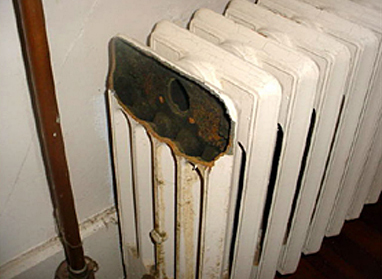 What caused this radiator to shatter and flood the room? A Fuel Usage Analysis can identify important details of a freeze up loss. Information gathered, as well as information from our Comprehensive Freeze Up Investigation, can provide multiple confirming sets of data and discoveries detailing the causes of these losses. • When did the oil tank run out of fuel? • When did the heating system shut down? • Did freeze-up loss occur due to thermostat setback? • Was the system operational consistently through winter months? A Fuel Usage Analysis can provide an independent evaluation to examine the conditions of heating system operation prior to a loss. This is just one of the many tools ISE can put at your disposal to help resolve difficult claim situations quickly and accurately.